With Alan Rankle, Maerz Contemporary presents a master of contemporary British landscape painting. Landscape art with a twist, one might say: for while Rankle's work is as visually spectacular and formally composed as the landscape art of the 17th & 18th centuries, it is infused with layers of modern art historical and contemporary cultural references. He paints what appear at first glance to be sublime tableaux, yet ones where nature is disturbed and threatened. "Rankle's depictions of Nature as luminous, tortured, polluted or damaged, conveyed in violent surges of paint, bold blocks of colour and diffused light make him a distinctive contemporary landscapist." Jackie Wullschlager, Financial Times. The painter was born in 1952 in Oldham, Lancashire and educated at Rochdale College and Goldsmiths' School of Art in London where he received his BA with honors in 1973. His work has been widely shown over four decades thoughout the UK, Europe and the US. During the Venice Biennale in Summer 2015, Alan Rankle was featured alongside Andy Warhol, Salvador Dali and Marco Nereo Rotelli at the opening of Isola delle Rose, an island resort re-imagined by Matteo Thun. His work can be found from the conservative surroundings of London's House of St. Barnabas to the glamorous La Villa Rose in Venice, in private and corporate collections such as Baker McKenzie, PriceWaterhouseCoopers and Exxon. 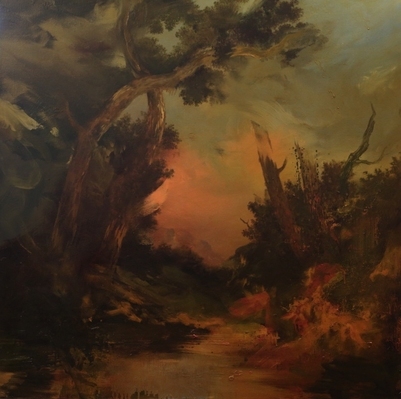 Clues to this artist's intense approach lie in a juxtaposition of traditional landscape painting with the environmental crisis, abstractly expressed amidst his formal mastery, and can be found in the titles of his series of works - On the Edge of Arcadia; On the Edge of Wrong; Landscapes for the Turning Earth; Formal Concerns; Wilderness Approaching. Art critic Sarah Lloyd summarizes Rankle's intensity for New York´s Artslant in her article on Running from the House. "Rankle takes issue with art that is visually spectacular but empty of meaning. He is at odds with some contemporary art's practice of existential and representational shallowness, with the use of surface narratives that veil rather than reveal". Alan Rankle says he wants to "locate the feeling tone of meaning within the landscape, not simply describe only the constructed surface".Whilst the viewer's logic may be challenged to find meaning in the seeming chaos of Rankle's real and fantastic scenes, the inherent aesthetics invite further contemplation. The artist wants your emotional engagement, to find the invisible in the visible.